Wild Heart has vast experience in production of festivals, community events, and markets from small to large scale. Wild Heart can take care of everything from administrative tasks (permits, grant writing, budget maintenance) to marketing (ad buying, campaign building) project coordination (vendor recruitment, community and stakeholder engagement) and site management (infrastructure, safety plans and security). Nuit Blanche returned to Edmonton for the second time since 2015 and Wild Heart Collective was once again brought on to facilitate production, staff needs and volunteers. This incredible event saw over 50,000 people to the downtown core. Vignettes is an interactive pop-up gallery design, curated and constructed by the local Edmonton creative community. Their incredible team have produced amazing pop-up events all over Edmonton. In 2018 Wild Heart was hired to assist with Event Production and Site Management for their VIP Gala. Wild Heart Collective worked with the Olde Towne Beverly Business Association to produce the first ever Olde Towne Beverly Dining Week. This week-long event featured the hospitality businesses of Beverly in a month-long marketing campaign. Folding Mountain Brewing is located 10 minutes West of Hinton on the edge of Jasper National Park. The team at Folding Mountain Brewing has created an atmosphere that allows you to enjoy a quality craft beer with unparalleled views of the Rocky Mountains. This destination spot is incredible, and Wild Heart was thrilled to be brought on board to help celebrate Folding Mountain Brewing’s first birthday! Quarters Arts is a non-profit society that engages in citizen-led projects that honour the heritage and explore the diversity of Boyle Street. GLOW is their annual Winter Solstice festival. GLOW brings together people of all communities to create a beautiful parade of lanterns throughout the downtown core! In 2017, Wild Heart Collective had the privilege of working with the City of Edmonton to animate and program Jasper Avenue during the Experience Jasper Avenue demonstration. Wild Heart was responsible for programming the area between 109 and 114 Streets, as well as for producing four signature events that took place throughout the pilot project. During the 2017 Civic Election, Wild Heart was approached by Ward D Candidate Kevin O’Connor to produce a fundraising and community engagement event. During the 2017 Edmonton Civic Election Wild Heart was recruited by Ward 7 Candidate Kris Andreychuk to produce an event series that highlighted local businesses from Ward 7. These events acted as fundraising and community engagement events for his Campaign. Eats on 118 is a project that began in 2016. Wild Heart was brought on to collaborate with the Alberta Avenue Business Association and City of Edmonton in coordinating an inclusive marketing plan and guided food tours for the diverse and eclectic businesses along 118 Avenue in Edmonton. The 2017 season was an even greater success with all tours selling out and engaged new restaurants and patrons. The Winter Cities Conference returned to Edmonton in 2017 and once again Wild Heart Collective was thrilled to take part in planning the festival. With a new location near the newly renovated Armature, Wild Heart Collective collaborated and consulted with the Core Committee to produce ideas of an inclusive, animated festival that would engage the existing community of downtown and all citizens of Edmonton to the newly renovated Armature area. Presented by Nuit Blanche Edmonton, Petite Nuit was a “small” version of 2015’s inaugural Nuit Blanche. Petite Nuit featured five commissioned artworks over two nights and was free to the public and suitable for all ages. Meet Me in McCauley Market was a series of two dynamically programmed events that took place in the summer of 2016 on historic Church Street (96 Street from 107A Avenue to 108 Avenue) in the Edmonton neighbourhood of McCauley. Working with the City of Edmonton and the McCauley Revitalization Steering committee, the focus was to produce inclusive events that included family-friendly programming, interactive workshops with a focus on urban agriculture and food security, performance and art installations and vibrant markets with diverse vendors. The Holiday Light Up is an annual event that is spearheaded by the Downtown Business Association. 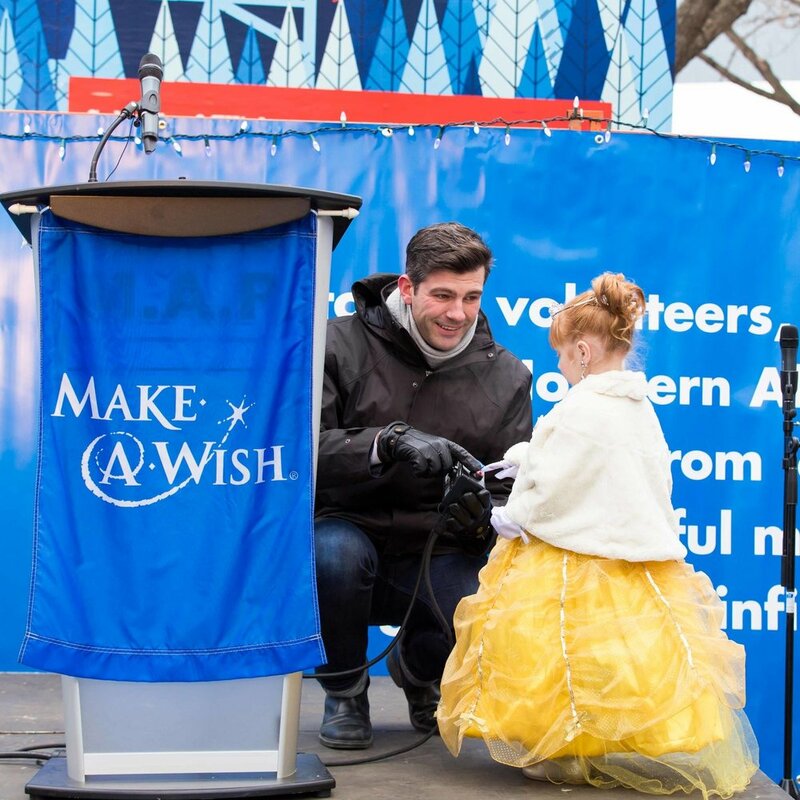 Each year, more than 10,000+ Edmontonians and their families gather in Churchill Square for the impressive light-up festivities including live entertainment, food and local treats. Since 2015 Wild Heart has been hired to do Site Management for this event. In 2015 the Winter Cities Conference was hosted in Edmonton, Alberta. The conference was focused on engaging people from a variety of backgrounds and disciplines to discuss all aspects of a “winter city” and new approaches to the quality of life in winter. Wild Heart Collective was hired to work with the City of Edmonton to program the Winter City Shake-Up and Market--one of the first large-scale outdoor winter markets and festivals. Wild Heart Collective worked in collaboration with the 124 Street Business Association to program and produce the very first All Is Bright festival in 2013. This event was the first of its kind for the 124 Street Area and included large-scale production, community and business engagement. The event featured a main stage with entertainment including the wildly acclaimed Shout Out Out Out Out, an outdoor marketplace and food truck area, outdoor beverage garden, children's programming and more.